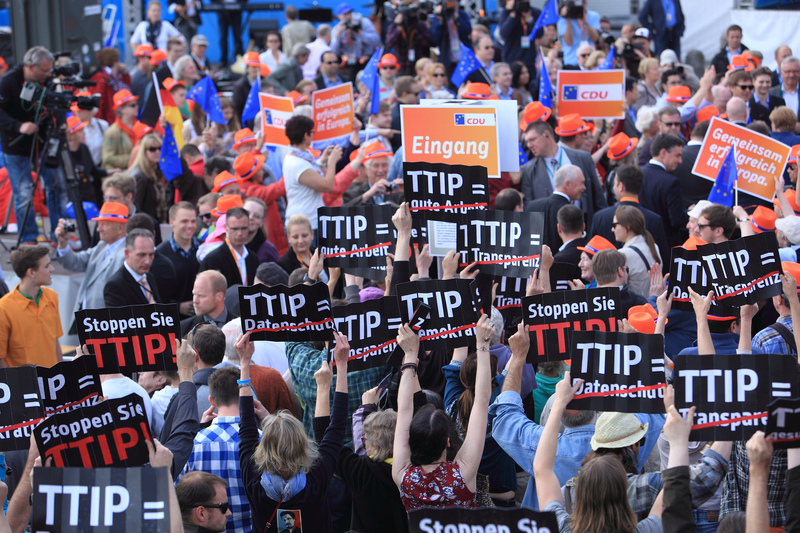 What is TTIP, what’s going on, and should we care? An anti-TTIP flashmob in Hamburg, Germany. TTIP, the Transatlantic Trade and Investment Partnership, sounds pretty dull, doesn’t it? I had to force myself to take an interest and read up on TTIP (pronounced ‘T-tip’) when a friend in the local World Justice Movement group persuaded me to organise a small delegation to my MP late last year. Even though I was merely the channel to a local MP and others in the group would do most of the talking, I thought it would be embarrassing to introduce a topic about which I knew little or nothing. So I did some homework. And like most people who read up about TTIP, apparently the world’s biggest ever trade deal, I became increasingly concerned. It’s not that there is anything intrinsically wrong with removing tariffs and freeing up trade between the USA and the EU, which is the main purpose of TTIP. On the whole, with the exception of a few developing industries in a few developing countries, protectionism does not seem like a good or necessary thing. But ‘harmonisation’ of regulations and standards, another aim of TTIP, could be a thoroughly bad thing, depending on whether this raised standards or reduced them – and, as the negotiations seem to be dominated by large corporations and their requirements, one can guess which way that will go. I use words like ‘seem’ and ‘guess’ advisedly, as another concern about the TTIP negotiations is their secrecy, the lack of opportunity for proper democratic scrutiny, and the haste with which some supporters want to push through the deal – though, fortunately for democracy, the negotiations seem to be proceeding at glacial speed. Our December meeting with my MP, Zac Goldsmith, went well. He, like many others, had found that the more he learnt about TTIP the more concerned he became – and he is keen to get other MPs (of all parties) interested and concerned. Since then, I have emailed all my (London) MEPs and received a couple of replies – one from a UKIP MEP who opposes the TTIP and a thoughtful response from a Conservative MEP, Syed Kamall, who supports it and has written about it for The Huffington Post here and here. It could be, as Syed Kamall suggests, that there is some exaggeration and scaremongering on the anti-TTIP side. It has been called by the World Justice Movement ‘the most dangerous free trade deal in a decade, [which] threatens democracy, public services and the environment.’ But if this ‘scaremongering’ is provoking debate and calls for openness and scrutiny it might not be a bad thing. For TTIP does now seem to be emerging from the shadows, with increasing interest from MPs and the media. In January, backbench MPs initiated a debate on the motion: ‘That this House believes that the Transatlantic Trade and Investment Partnership and any associated investor-state dispute settlement provisions should be subject to scrutiny in the European Parliament and the UK Parliament’ (Hansard report here). Business Secretary Vince Cable and the Liberal Democrats seem to be pulling back on TTIP, perhaps as part of a pre-election distancing from the Tories and the Coalition. There was some speculation that the sudden government rush to legislate for plain cigarette packaging was at least partly because it could become much more difficult post-TTIP. And there was also a useful half-hour discussion on Radio 4’s In Business programme in January. So the discussion does seem to be hotting up, and that’s an achievement for the charities and pressure groups that have been campaigning on TTIP. However, it often seems as if the different sides are talking about different things, and what one thinks about TTIP does depend on one’s personal priorities and preferences: a boost for economic growth and businesses versus protections for consumers and national rights to regulate corporations. Like many of the issues highlighted by Humanists for a Better World, TTIP is not a core BHA policy concern, and it’s certainly not an exclusively or particularly humanist issue – it’s one for all active citizens. At the very least, thoughtful voters should ask questions about TTIP and try to persuade our democratically elected representatives to take an interest in it and insist on transparency and opportunities to scrutinise and amend the treaty before it’s a done deal. If you’d like to know more about TTIP or take action on it, do please have a look at H4BW’s December 2014 briefing on TTIP. Thank you for a thoughtful piece on this difficult subject. I have in the past signed petitions about this, but have found the campaigning against TTIP very strident and dogmatic–even apocalyptic; I have noticed that the Economist and the Independent, two papers I trust, have been generally favourable in principle, though concerned about some provisions: I think a main concern is the exclusion of the judicial systems of member countries in the case of legal disputes; the whole thing needs to be brought into the open, and discussed calmly and rationally; thanks for raising the issue; I can see that it is not a humanist issue as such, but the article is admirably balanced in the way it raises awareness. Is how human judgements are reached NOT a Humanist issue? I agree with you, David; I suppose what was meant was that it is not an issue of Humanism v Religion; but, of course, it is also a political issue; politics is a good thing, and maybe what is wanted is a Humanist political discourse. I’d love it if such issues were central for the BHA and humanists more generally, but that’s not the impression I got when we set up Humanist for a Better World! I don’t know if some of the comments still exist somewhere in the Humanist Live archive – but the gist was that all these global issues had nothing to do with Humanism. Of course those might have represented a tiny minority of members, but the fact is that those signed up to H4BW still remain a (slightly disappointing) minority of BHA members. Of course, one could be a humanist, and still think that TTIP is a good thing; humanism implies human-centred values, but not that any particular proposal is good or bad; however, humanism does offer a perspective from which to assess such proposals. Is the BHA realy interested in members’ initiatives like H4BW? Well, the BHA has been very supportive of this particular initiative, perhaps because it was the BHA that first suggested this sub-group of volunteers to manage going to meetings and sharing and publicising some of the ethical/global/environmental campaigns that the BHA had signed up to. The BHA helped us to set up a website and then move it onto the BHA website; and the BHA regularly gives us space in the weekly newsletter. We wouldn’t exist if it weren’t for the BHA and its trustees, who are BHA members – so to that extent it was a members’ initiative, one that I was very happy to pick up! H4BW, like all the other specialist interest groups for humanists, for example the political ones, share humanist values but we don’t and can’t expect all BHA members, who join the BHA for all sorts of reasons, to support us or agree with all the causes we circulate information about. I’m not even sure I do always and completely, but as a liberal I think we should offer information and the option of supporting them. And none of these causes and campaigns, I believe, run contrary to humanist values or working towards a better world, something I imagine all humanists want, though we may differ about how to get there. In the case of TTIP, people are bound to differ but I think asking questions, finding out more, and demanding transparency are very much aligned with humanist values and ways of thinking.